As I give so shall I receive from all Watchtowers, below and above. With conscious thought and mindfulness the Otherwhere I enter. 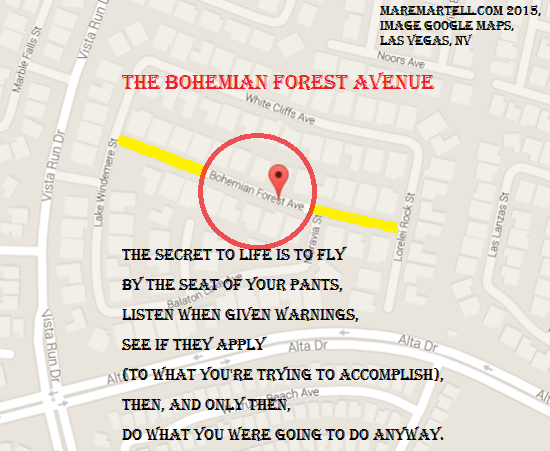 Bohemian Forest Avenue is located in Las Vegas, NV. Google Maps made the image. I Regret that I didn’t realize sooner what was occurring. I Regret that my need to hope that things would improve could not be sated by the harmful actions of others. I Regret that I saw the omens, realized the map, and ignored my compass. But, for now, I will gestate in the womb of change while I grow into my new spirit self. While I bloom, blossom, develop, and change. The risks that are involved, while in this state, are negligible.